Tag line: "Young men torn between physical desire and religious discipline"
Fred Schepisi’s directorial debut, 1976’s The Devil’s Playground, is a semi-autobiographical account of life in a 1950’s Catholic seminary. Starring young Simon Burke, it tells the story of a 13-year-old seminarian whose devotion to God and the church is in direct conflict with his budding sexuality. Tom Allan (Burke) is one of many boys at the seminary, all of whom are trying to come to terms with their libidos. Though picked on by some of his fellow students (because he’s a bed-wetter), Tom maintains a close friendship with Fitz (John Diedrich), who, despite being several years older, shares Tom’s doubts and fears as to whether he’s fit to become a man of the cloth. For guidance, Tom turns to his instructors, only to discover most of them are as confused as he is! Though only a teenager at the time (around 14 or 15 when the film was shot), Simon Burke’s portrayal of Tom is nothing short of remarkable. Playing such a demanding role with the confidence of a seasoned professional, Burke ensures that we are always in tune with what his character is feeling, and understand exactly what he’s going through. In one humorous (if uncomfortable) scene, Tom is in the confessional, where he admits to the acerbic Brother Hanrahan (Gerry Duggan) that he masturbates frequently (2-3 times a day). Following a brief tirade, Brother Hanrahan absolves Tom of his sins, gives him his penance, and sends him on his way. To Tom’s horror, his classmates, many of whom were praying just outside the confessional, overheard the boisterous brother, and they begin to snicker amongst themselves. Though played primarily for laughs (Tom’s chronic masturbation is already well-known throughout the seminary), we can’t help but feel sorry for the poor boy in this scene, and Burke’s gentle, heartfelt performance is the reason why. In addition to Simon Burke, I was impressed with how The Devil’s Playground handled its adult characters. Far from demonizing the seminary’s Brothers, Schepisi shows that they’re every bit as human, and prone to temptation, as Tom and his friends. During a weekend getaway, Brother Victor (Nick Tate) and Brother James (Peter Cox) take in a rugby match, then head to a nearby pub for a few beers. While there, Brother Victor spots a couple of pretty women sitting by themselves, and approaches them, causing a shocked (and incredibly nervous) Brother James to run for the door. Not to be outdone, the senior Brother, Sebastian (Charles McCallum), believes masturbation is perfectly normal, and wonders aloud if there’s actually a God in heaven. Even the stern disciplinarian, Brother Francine (Arthur Dignam), has his weaknesses; after catching a ride into town with Brothers Victor and James, Brother Francine says he’s going to visit a local museum, but instead hangs out at a public pool, gawking at women in various stages of undress. By spending as much time with its adult characters as it does the students, The Devil’s Playground is one of those rare coming-of-age films that isn’t a “kids only” affair. 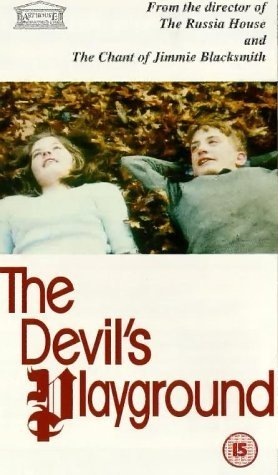 Winner of 6 Australian Film Awards including Best Picture, Best Director, and Best Lead Actor (shared by both Simon Burke and Nick Tate), The Devil’s Playground is as auspicious a directorial debut as they come, and the work of its entire cast, coupled with Schepisi’s documentary-style approach to the material, ensures that the movie is as relevant today as it was in 1976.